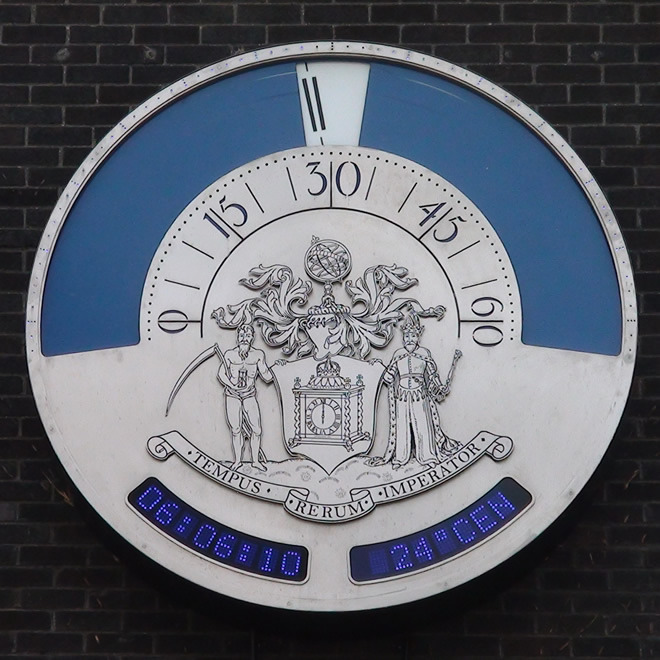 The Newgate Street Clock was presented to the City of London by members of the Worshipful Company of Clockmakers to celebrate their Company's 375th anniversary. Unveiled on Thursday 31st May 2007 by The Rt. Hon. The Lord Mayor, Alderman John Stuttard. The City of London Initiative Together with the efforts of Mrs Ann Pembroke C.C. And the contribution of the Clockmakers Company are gratefully acknowledged. 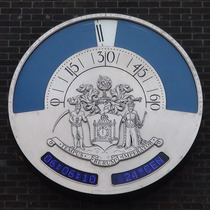 The size of this "wandering hour" clock, a 2 metre diameter, makes it unique. The arms of the Clockmakers company are at the centre of the dial. From the City of London: "The design of the clock draws its inspiration from the work of Joseph Windmills, a 17th century clockmaker whose first workshop was at the junction of Newgate and St Martin’s le Grand in the City. The wandering hour dial was devised for domestic clocks in the mid-17th century and immediately adopted by a few leading London makers. In the late 17th and early 18th centuries, the design was adapted for use in a few exclusive London-made pocket watches, including a group by Windmills. The hour numerals pass in turn across an aperture in the upper part of the circular dial, pointing as they travel, to the minutes. As a new hour rises, so the old one sets. This ingenious mechanism has been adapted for the Newgate Street Clock by renowned clockmakers Smith of Derby to create a blend of high quality traditional engineering and state-of-the-art electronics. It has a stainless steel dial, makes use of modern technology, such as LEDs and GPS signal correction and is wind and weather-proof." This press release does not confirm our suspicion that the tower to which the clock is affixed is a ventilation shaft, see Dance's Obelisk. Deputy, Corporation of London representative, Dr Johnson's House Trust.